This spring can go down with the last few seasons as "high water" springs, and this one seems to win the prize for having the most consistent high water conditions. Right when John and Lauren showed up at Oregon, the rains hammered the river levels back up to bloated from the few days of low water we briefly had. Water clarity was really good though; since the McKenzie can really take a lot of abuse before its color gets affected. Luckily at this time of the year, the fish are looking up, and the famous McKenzie Green Caddis have been coming off in good enough numbers to become the target of many "hit and runs" for the river's trout. They really love eating those big green awkward bugs that bounce and skitter on the water. The wet fly swing really gets some serious tight line grabs this time of the year, and the fish are well fed and fight with serious attitude lately. This turbo charged powerful McKenzie River Rainbow really hit a green caddis wet hard! With the water rising up on Thursday night, it seemed to really damper the "human hatch" where we luckily only saw a few boats out there all day. The fishing was fare to good at times yesterday, and we got into some nice powerful feisty fish. Most of the fish were taking swung wets, and a few took the nymph on a dry fly and dropper rig. The weather was wonderful, and it started out cloudy and calm and slowly dissipated off into "sunny with a cloud here and there" type of a day. The winds stayed calm to light, and that seemed to be a key factor in our success out there. Any time the sun shined bright and the wind would blow slightly; causing the fishing to slow down, and when the sun was hidden behind clouds we got hits from all of the spot that they should have came from. If you have not fished the McKenzie River when the green caddis are coming off; you need to get out there and experience it. Normally these large green bugs start to come off hard in early May, but this season they have literally just gotten going. They should come off for the next few weeks, and it is a time when you can really get into some of the nicest fish the McKenzie has to offer. 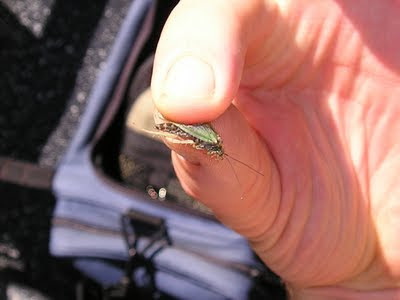 The fish have just finished spawning, and now they are fattening back up on these big green bugs. Get yourself out there to experience it!